Tayenebe is an important exhibition that has just finished at the NMA and will be moving onto the Queensland Museum. It documents the rebuiling of basketmaking skills among Tasmanian Aboriginal women over the last decade or so. Thirty seven women were involved in a series of workshops throughout the state, and more than twenty of those women have pieces in this small but exquisite show. 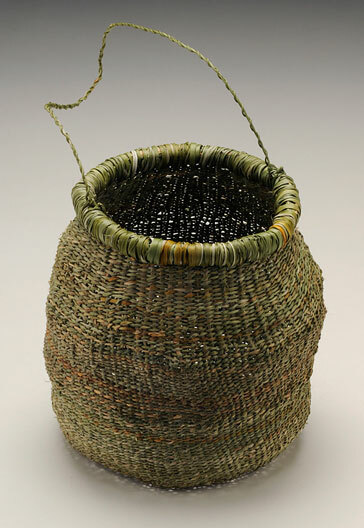 With funding from the NMA and the Tasmanian Art Gallery & Museum, it is dedicated to the memory of Aunty Muriel Maynard who had long been involved in basketmaking and other Indigenous making skills as documented in Crossing the Strait, edited by Kathryn Wells to accompany an exhibition in Wollongong in 2003. The Tayenebe project has seen skills learnt and handed on, knowledge of country and its plant resources and the revitalisation of the particular Tasmanian weaving style. The baskets themselves talk to their sense of place, their evocation of where they were made, where the plants grew and were harvested, and why they were made. These simple, often small objects are more than eloquent reminders that the Tasmanian Aborigines have against extraordinary odds, maintained self, place and culture.